Weddings & Special Events — [Theoretically] Brewing Co.
Planning a wedding or special event? Let us help you with the bar. We are happy to provide everything from draught beer to custom labels, bartending services to licensing help. Congratulations on your up-coming Special Event! Whether that is a Wedding, a landmark Anniversary, the opening of your own Business, a Birthday Party, or a Reunion local craft beer is an excellent choice for providing something extra to the festivities! We offer several ways to take advantage of Local Craft Beer! Larger events such as weddings and reunions benefit from the cost-saving properties of draught beer! 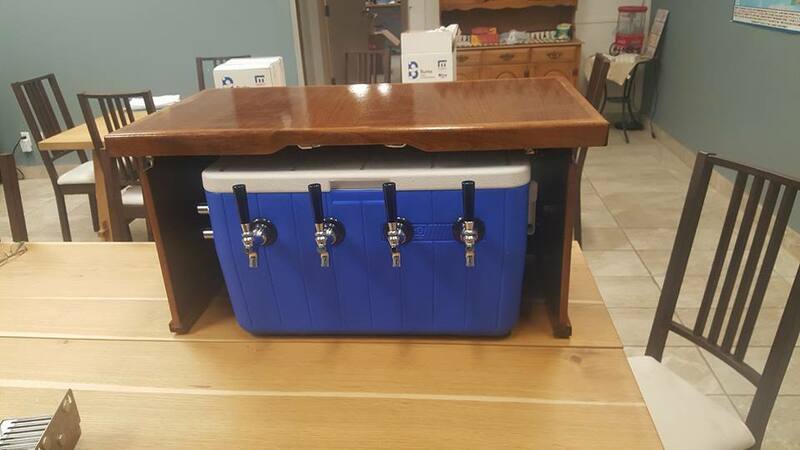 We can provide kegs in various sizes to accommodate your group, and our portable, easy-to-use jockey box makes sure the draught stays cold and pours perfectly! Kegs are available in 20L, 30L, and 58L size depending on how many varieties of beer you order, and how large your event intends to be (attendees x length of time). We will deliver kegs and box to your location, ensure you are set up and flowing nicely, provide extra ice, and come and pick up the equipment at the end of your event. Need a bartender to help pour? Not a problem! Our staff are all trained bar tenders and can assist you with anything you need. See Bar Tending below for more details. Want a favour everyone will be thrilled to take away? Custom-labelled beer featuring your artwork or picture is available for pre-order in 2 sizes! Custom label standard 341mL twist off beer bottles, or pick up some 650mL Bombers for an even bigger gift! Pass along your artwork when you order your beer and we can put a custom label together featuring whatever you need! Custom Cask Ales are available! Have particular flavours you would like to see incorporated into your favourite [Theoretically] Brewing Co. ale! Give your guests a show and tap the cask yourselves, or have our expert staff tap it for you! Bartender services are available, please contact us for more details! None of your guests want to be stuck behind the bar all night, but independent Bar Tenders are sometimes difficult to contact. Don't fret! Our staff our trained bar tenders with years of experience and are happy to provide your bar service for you! Beer, wine, cocktails, and more-- our staff are happy to help you with all of your bar-tending needs, including getting the appropriate licensing for you! Let us look after the bar at your event, and we will custom-tailor cocktail menus to your event. We can also procure local spirits for your event as needed, simply inquire with us! Thank you for contacting us about your event! We are excited to get back to you and will work to do so as quickly as possible.